Printed copies are just now making their way into doctors’ offices in Vero Beach but one local family practice physician, Dr. Deborah Brown, at Cleveland Clinic Indian River Hospital, already is an enthusiastic fan of the new guidelines. Brown is especially pleased that the updated guidelines reflect a sort of alliance between the American Diabetes Association and the American College of Cardiology. The alliance is important because many of the risk factors and bodily imbalances that go along with diabetes also can cause or are correlated with heart disease. “The connection between diabetes and heart disease starts with high blood-sugar levels. Over time, the high glucose in the bloodstream can damage the arteries, causing them to become stiff and hard. Fatty material that builds up on the inside of these blood vessels, a condition known as atherosclerosis, can eventually block blood flow to the heart or brain, leading to heart attack or stroke,” according to everydayhealth.com. Type 2 Diabetes, the most common form of the disease, is a complex chronic illness. It requires continuous medical care and risk-reduction strategies, but it can be successfully treated – and when it is, a patient’s risk of heart disease generally goes down too. More than 100 million American adults – nearly a third of the U.S. population – are now living with diabetes or pre-diabetes, according to the Centers for Disease Control, including well over 30 million who actually have the disease. Many who are pre-diabetic aren’t aware of their condition or the risk it poses. Brown knows that particular aspect of the disease all too well. Brown was well aware that blood-sugar levels between 100 to 125 constituted pre-diabetes, so her 126 level was a real wakeup call. She also knew that meant she had a 25 percent chance of developing diabetes in the next three to five years. “If the odds of winning the lottery were 1-in-4, we’d all be to buying tickets,” Brown says, but developing full-blown diabetes was not a jackpot she had any interest in winning. So she launched into her own “lifestyle modification” regimen, including a healthier diet, weight loss, exercise and even participating in triathlons and half-marathons. 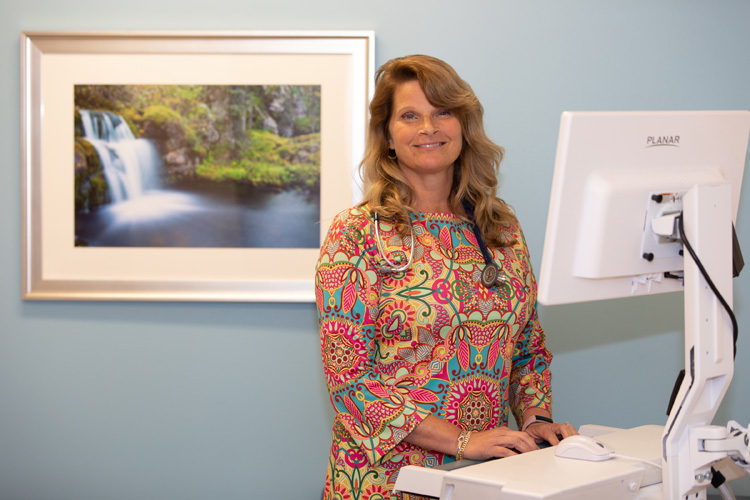 Now armed with a medical degree and a growing family practice in Vero Beach, Brown is excited about the new diabetes standards of care. In a nutshell, these new standards include new “goals of care” along with new language to help patients better understand their treatments, a new “treatment algorithm” designed to simplify insulin treatment plans, new tables to help guide healthcare providers like Brown in simplifying medication plans for older adults, new treatment recommendations for children and adolescents, and, perhaps most strikingly, an all-new collaboration with the American College of Cardiology. Cooperation between members of what Brown calls “your medical neighborhood” in diabetic treatment – which can include diabetic educators, RNs, medical nutritionists, podiatrists, ophthalmologists, endocrinologists and even personal trainers – is essential, and she says these new standards of care will definitely help. “I think the most important thing is that we’re going to start treating diabetes like we do other chronic disease models. The patient comes first and is in the center of that neighborhood. You’re surrounded with a team that helps you manage the disease. We’re no longer just focusing on lowering your blood glucose and getting your hemoglobin A1c in line. Now it is a collaborative effort,” Brown says. If you or a family member has diabetes or pre-diabetes, now is a good time to check with your primary care physician and see how these new standards of care might affect you or your loved one. Dr. Deborah Brown is with the Cleveland Clinic Indian River Hospital. Her office is at 3450 11th Court. Suite 201 in Vero Beach. The phone number is 772-794-3364.